Because of shortages of good copper coins (most of the official issues were being melted down and re-issued as forgeries), many local companies started to produce their own "token" coinage. The first of these were the pennies of the Anglesey Copper Company in 1787. Following this, there were large numbers of privately issued "coins" or tokens issued, most of which were well designed and produced, and make up an entire and important segment of the British coin collecting scene. 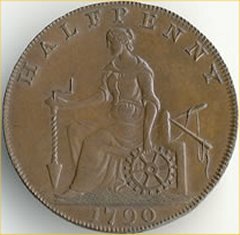 We have shown the reverse of a Warwickshire halfpenny token of 1790 to illustrate a very industrious Britannia, but need a better photograph. The figure is not actually named as Britannia, so she may be "Industry" instead, or it is possible that she may represent industrious Britannia. This however is not the best place for us to expand on the theme of tokens. If we ever get the spare time, we will try to add a short section about tokens. We want to buy any trade tokens featuring Britannia, particularly in better grades, so that we can display more, and better, photographs on this page.